The Sunlit Night is a poetically wrought tale about love and loss. It’s a debut novel that charms us with its whimsical young characters finding their way in a harsh, and sometimes disillusioning, world. The two different lives of these young people coincide after a disenchanted Frances journeys to a desolate artist colony north of the Artic Circle. When she meets Yasha, who by a twist of fate ends up at the ‘top of the earth’ too, they confront both their pasts and their futures. Indeed, it’s no surprise to learn that Dinerstein herself spent a year in an artist colony at Lofoten and has published a volume of poetry she wrote there. 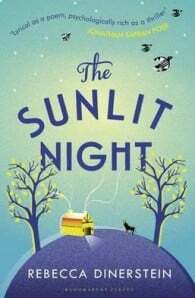 Though set in a moonless northern summer, The Sunlit Night makes a timely read as we approach the southern solstice at the end of this week – perfect reading to transport you to another world on a winter night.